The Dog and the Horse (Moonlight Editions). By Voltaire; Translation by Anthea Bell. New York: Schocken Books, 1981. First Edition, First Printing Pictorial Boards Near Fine in Near Fine DJ 8vo (5-1/4 x 7-3/4), 19 pp (unpaginated). Small hardbound book is NEAR FINE --unmarked, all pages tight and clear, in NEAR FINE unclipped glossy pictorial DJ. Barely visible bumping on spine ends. 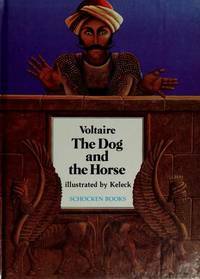 One of Voltaire's Zadig stories. Brilliant illustrations in the ancient Persian style by keleck. The Emperor's Nightingale (Moonlight Editions). By Andersen, Hans Christian; Translation by Eric Haugaard. New York: Schocken Books, 1981. First U.S. Edition Pictorial Boards Fine in Near Fine DJ Small 8vo (5-3/4 x 7-3/4), 36 pp Unpaginated. Small hardbound book is FINE, all pages clean, tight, unmarked in unclipped NEAR FINE glossy pictorial DJ. Lemoine's illustrations invole the art and charms of legendary Cathay.